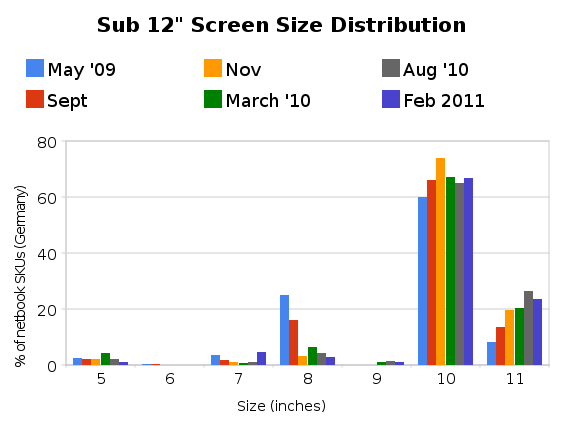 Tag Archive | "screen size"
I’ve been collecting data on the distribution of mobile internet device screen sizes since 2009 when the first handheld computers arrived with Origami and UMPCs. 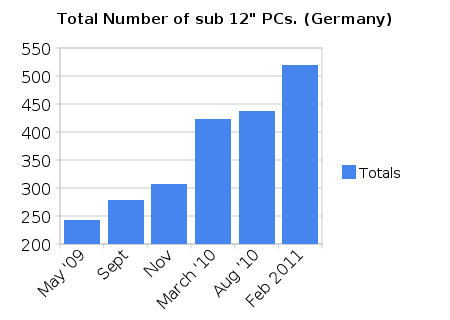 At that time there were about 240 SKUs being offered in Germany and most were netbooks. Today there are about 1200 products being offered and the 7-inch category has exploded. 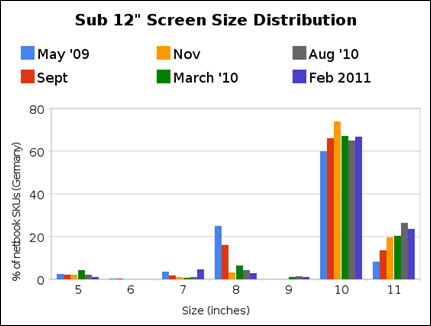 This is the sixth report on sizing trends in PCs below 12 inch screen size (and above 5 inch) appearing in the German market through the popular price comparison engine, Geizhals.at (*1) The last one was done in August 2010 In this report you’ll see a big jump in overall numbers, a reversing of the decline in 7 inch devices and a turnaround in the 10 inch segment. Number of SKUs in the market. The big jump in numbers is clear to see from the top graph. Total numbers jumped by 83 and this is likely to be due to the Christmas season and introduction of new model ranges following IFA 2010. Surprisingly, the 10 inch segment has grown in numbers and %. 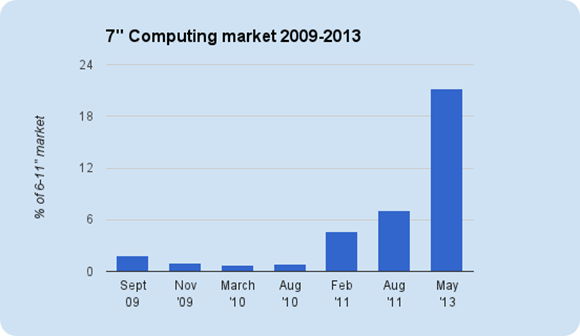 A lot of this is attributable to dual-core Atom N550 devices. Over 20 Intel Atom N550 devices appeared exclusively in the 10 inch category. Including Android, over 14% of the segment runs a Linux kernel. One year ago this figure was 5%. 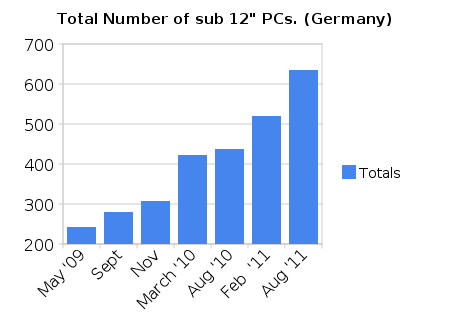 Almost all of this growth is within the ‘tablet’ style of devices. 18 devices now include Nvidia ION2. All of these are from a single manufacturer – ASUS. 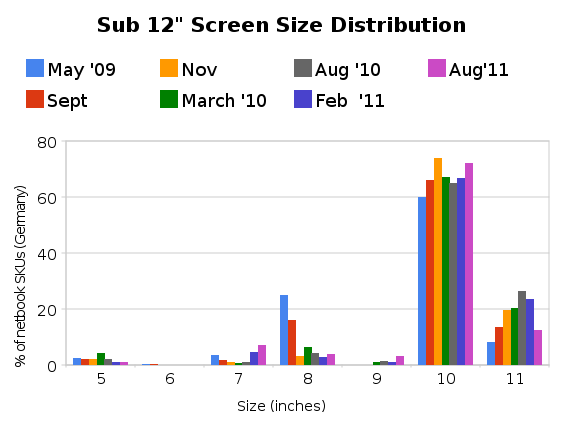 Total number of tablet form-factor devices â€“ 60 (not including 4.8 inch) which is about 10% of the total sub 12% screen size market. X86/Windows Tablet â€“ Archos 9 at 402 Euros. Also of note is the larger spread of GPU technologies, the increased us of SSDs (even in the X86/Windows segments) and a large number of dual-core CPUs. Dual core CPUs make up a 30% of the 10-11.6 inch bracket now. In the last report I talked about a netbook freeze. Certainly the trends for search and news seem to be heading south (see below for ‘netbook’ trend) but the increase in numbers of 10 inch devices indicates that there is still interest from manufacturers. The increase in SKU’s, however, could be misleading as we’re seeing an increase in the number of colour options, CPU options, GPU options and screen options that use the same chassis. Acer and ASUS each have over 90 different model types in the German market in the 10-11.6 inch category. I think most people in the netbook field would agree we’re seeing a levelling of interest and manufacturers are using offers and personalisation to attract sales in this mainstream part of the segment lifecycle. For mobility fans though the message is clear. There are more options than ever and competition is increasing which will drive improvements in software and hardware very quickly. Certainly we will see the tablet segment grow and it will be interesting to see how the 5-9 inch segments move when we do the next analysis in about 3 months time. *1 Based on SKUs, not model families. Note that Geizhals have now moved all tablets to a new category called ‘tablets.’ This category was included in the analysis. An English language (and UK market) version of Geizhals is available at Skinflint.